Home Sarfraz Ahmed Pakistan captain Sarfraz Ahmed apologises after racially abusing South African cricketer ! 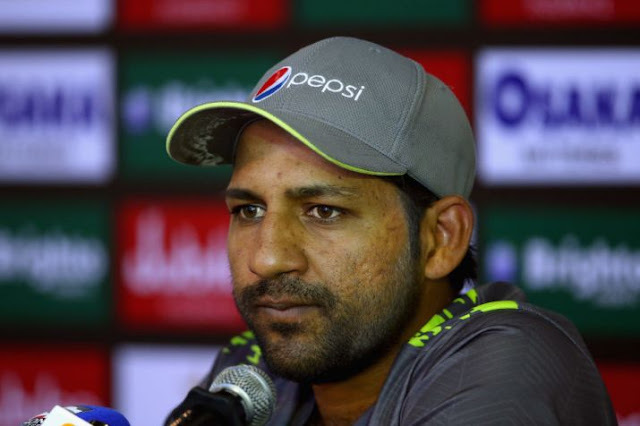 Pakistan captain Sarfraz Ahmed apologises after racially abusing South African cricketer ! Sarfraz Ahmed has said sorry after his racial abuse of South African all-rounder Andile Phehlukwayo was caught on stump mic during the second ODI in Durban. Sarfraz was caught on stump mic referring to Phehlukwayo as "abey kaale"
Pakistan captain Sarfraz has apologised after his racial abuse directed at South African all-rounder Phehlukwayo. Sarfraz's comments were heard on the stump microphone during Pakistan's defeat in the second ODI in Durban in Tuesday. His comments were widely condemned on social media and former Pakistan pacer Shoaib Akhtar asked Sarfraz to apologise. In line to be sanctioned by ICC, Sarfraz tweeted out a long apology but it remains to be seen whether that is enough. The world governing body is already investigating the incident. Sarfraz Ahmed was getting frustrated as Phehlukwayo and opener van der Dussen were stitching a match-winning stand for the 6th wicket after Pakistan had South Africa reeling at 80 for 5 in chase of a modest 204-run target. Sarfraz made the comment even as Phehlukwayo inside edged a Shaheen Afridi delivery to deep fine leg and was running towards the non-striker's end. Pakistan Cricket Board also released a statement expressing regret over Sarfraz's comments and asserted that PCB does not support such remarks. PCB was confident that the incident will not affect the spirit with which Pakistan and South Africa have competed so far. The PCB expresses regret over the remark made by their captain Sarfaraz Ahmed and picked up by the stump mic during the second ODI against South Africa in Durban. The PCB neither endorses nor supports any comments that have the potential to cause offence, and firmly reiterates their zero-tolerance approach towards racist comments made; in whatever context.